328 1955 December Meeting Continued Dec 20 boarder, we opened our program By giving the Salutes to The Three Flags America Christian and Temperance Mrs Beattie had the program. She read a tract entitled, "To Busy for God" we need take time for daily family devotions Miss Keister reviewed a chapter from Our Study book The Way to Sobriety. Mrs Beattie brought a story on the "Black Madama" meeting close By saying The Aaronic Benediction. Celia. Whitely Sec protem 1956 Jan 17 WCTU held its regular meeting at The home of Mrs Beattie, Mrs Casand had the Devotions She read the spiritual life report, which stressed especially being filled with the spirit and giving power and witnissing Mrs McBlaine led in prayed Elais Keister Vice President, opened the business meeting using the pledges to the 3 flags of America She also read a letter from La Compte In answer to the petition which was sent in at the last meeting. Mrs M.Blaine expressed thanks to all who sent cards, while She was ill Mrs Beattie also expressed thank to those sending cards to Mr Beattie while he was in the hospital. 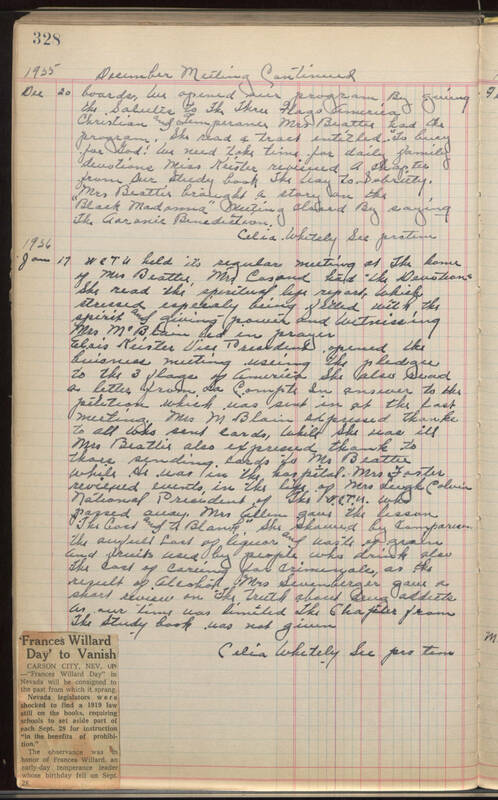 Mrs Foster reviewed events, in the life of Mrs Leigh Colvin National President of The W.C.T.U. who passed away. Mrs Allen gave the lesson "The Cost and A Blank," She showed by comparison the awfull cost of liquor and waste of grain and fruits used by people who drink also The cost of careing for criminals, as the result of Alcohol. Mrs Sevenberger gave a short review on "The truth about drug addicts as our time was limited The Chapter from The Study book was not given. Celia Whitely Sec pro tem 'Frances Willard Day' to Vanish CARSON CITY, NEV, (AP) - "Frances Willard Day" in Nevada will be consigned to the past from which it sprang. Nevada legislators were shocked to find a 1919 law still on the books, requiring schools to set aside part of each Sept. 28 for instruction "in the benefits of prohibition." The observance was in honor of Frances Willard, an early-day temperance leader whose birthday fell on Sept. 28.